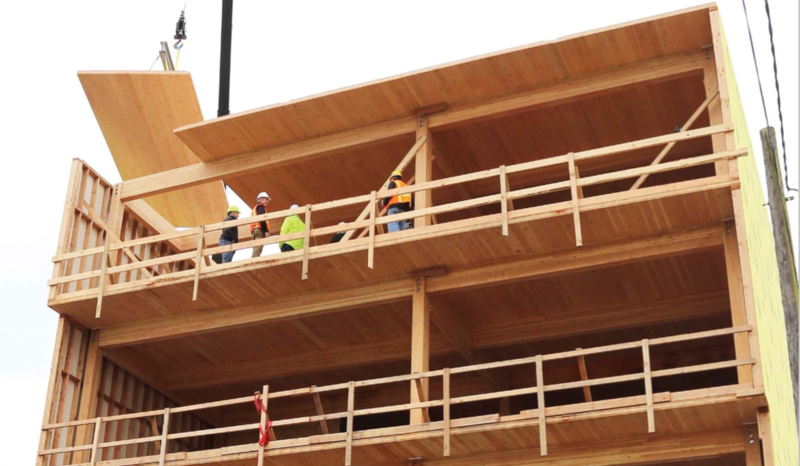 Teacher Resources > Monday Morning Ready > Move over, steel: The high rises of tomorrow are "plyscrapers"
What are the advantages and disadvantages of using CLT to build a tall structure? According to the article, CLT and other mass timber products have been used in Europe for nearly 20 years. Why do you think it's taking so long for it to be used in the U.S.? Why do you think stacking and gluing boards in alternating layers makes CLT boards stronger than if the wood had been created using parallel layers? In the article, Portland architect Thomas Robinson compares CLT to an IKEA cabinet. Do you think this is a good comparison? Why or why not? Read this Smithsonian article to learn about the winners of an annual skyscraper design competition where designers are encouraged to think way beyond the “tall rectangle with windows” model. In this lesson from the Smithsonian Institution Archives, students will learn about James Renwick, Jr. and the architectural history of two Smithsonian Institution buildings he designed. They will practice describing what they see, make their own designs and turn a rough early drawing into a final model. Use the lessons in this issue of Smithsonian in Your Classroom to help students explore the weathering of buildings, which begins the minute the structures are built. Physical breakdown (such as rock fracture), chemical weathering and pollution are all key ingredients in this discussion of the geology of the built environment. This Smithsonian Traveling Exhibition introduces students to Mohawk ironworkers who, for more than a century, have helped build some of New York City’s most prominent landmarks.